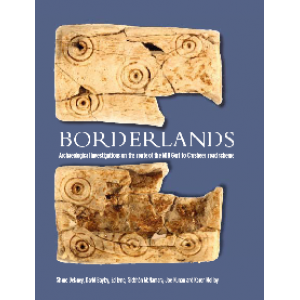 Borderlands describes archaeological investigations along the route of a national road project on the borderlands of south Galway and north Clare, where discoveries were made from the Neolithic, Bronze Age, Iron Age, medieval and early modern periods. There was evidence for Neolithic and Bronze Age settlement at Rathwilladoon, consisting of vestigial building remains, pottery and chipped?stone tools. Investigation of over a dozen sites at Caheraphuca widened the scope of inquiry into the enigmatic burnt mounds or fulachtaí fia of the Bronze Age by bringing detailed pollen analysis and environmental reconstruction to bear on the little valley where these were found. Iron Age ring?ditch burials were recorded at Ballyboy, yielding cremated human bone, an exceptional collection of glass and amber beads, and a tiny bone dice?a poignant reminder that death and chance are constants in all periods. Iron Age metalworking was represented by a smelting furnace and charcoal kilns at Rathwilladoon and Derrygarriff. A group of exceptionally well?preserved early medieval cereal kilns was recorded at Curtaun, near a large ringfort. Unusually, these were protected by a curvilinear wooden structure, possibly remains of a ‘kiln house’, and were re?used in the later medieval period. The book is lavishly illustrated and the archaeological discoveries are presented in an easy, narrative style.